Being the singer and showman that he is, Gene recognized the value of the great Western songs that were being written. In his own style, he performed these songs in his movies with the script being written around the song. Later, on his radio show, he called them "Cowboy Classics." And Cowboy classics they are, because the Cowboy and his songs are as much of our American heritage as Mom's apple pie. When Mr. Autry was asked to make an album it was no great surprise that he wanted to include a "few" of these great songs from his movies. After some researching it was found that there was no way to include just a "few" of these songs. Finally the decision was made to do an entire album of "Cowboy Classics." 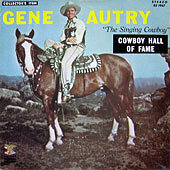 Again the decision was right and Republic Records is proud to present Gene Autry's Cowboy Hall of Fame.